We recently decided to see how correlated the S&P Nifty is with Dow Jones (US index) and if they were becoming more or less correlated in recent years. The below chart shows the 20 day correlation between S&P Nifty Index and Dow Jones Index. From the charts one can see that during Mid of May the correlation achieves its peak value(0.93) and from there correlation starts dropping which indicates that S&P Nifty will decouple slowly from Dow Jones Market movements in the upcoming days. Make Sure you had done with all the above mentioned procedure. 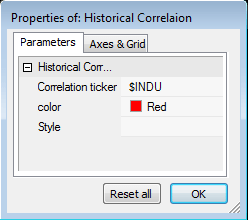 Do you added the correlation symbol in the parameters section as mentioned above? how to set parameters..no. of days for which correlation has to be computed? Thank you very much i was looking for this. Is it possible to have a drop down list instead of having to type in each symbol? Thanks very much for sharing. I have used and adapted several pieces of your code for my own use. Your code is very understandable! I realize it takes time and effort to share!!!! Dave.